You will earn 612 Reward Points. Earn 1 reward point for every 1 dollar spent. Finishes: Available in chrome-plated, Metroseal II™ or stainless steel. Smooth Loading/Unloading: The front to back upper ribs of the deck allow you to slide items on and off the shelves smoothly. Two-Piece Design: Removable wire deck fits over reinforced 1 1⁄2" (38mm) square, tubular frame. It lifts off for easy, thorough cleaning. Adjustable: Rolled grooves on the posts enable dunnage shelves to be positioned or repositioned at desired levels in 2" (51mm) increments. 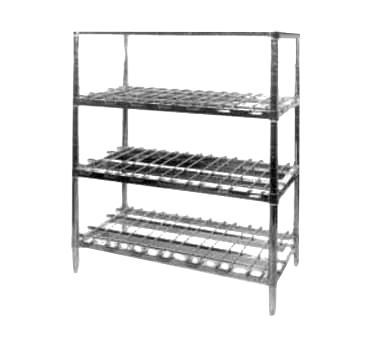 Stress Resistance: The high static-load capacity of the HD Super dunnage shelf translates into an increased ability to stand up under the strain of unbalanced loads and the stress of materials repeatedly being placed on the shelf in a lessthan-gentle way. HD Super™ Construction: These dunnage shelves have the same tapered corners and split sleeves that fit the 15⁄8" (41mm) posts used for other HD Super shelves. As a result, they assemble easily, fit securely and are compatible with 48 different HD Super shelf types and sizes. Superior Strength: Dunnage shelves offer up to 133% more weight-bearing capacity than other HD Super shelves and can be combined with them to provide extra strength at the lower levels of a shelving unit where the heaviest loads will be placed. The 48" (1220mm) length has a 3,000-pound (1365kg) uniformly distributed static load capacity; the 60" (1520mm) shelves hold up to 2,400 pounds (1092 kg). Shelves: The shelf support frame is made of 1 1⁄2" (38mm) square tubing. The removable wire deck is formed from 5⁄16" (7.9mm) diameter wire. Posts: Posts have an outside diameter of 1 5⁄8" (41mm) with rolled grooves in 2" (51mm) increments along entire height. Available in chrome-plated, Metroseal II™ or stainless steel.